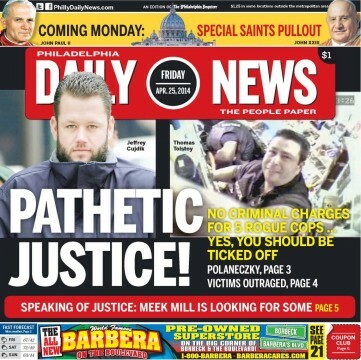 Police Commissioner Charles Ramsey announced yesterday that Officer Jeffrey Cujdik has been suspended for 30 days with intent to dismiss, the Inquirer reported last night. Ramsey told the Inquirer that Cujdik, a member of the Narcotics Field Unit who was seen on video dismantling the surveillance-camera system during a raid on a bodega, along with other officers, will be fired. Twenty- two shop owners had independently come forward in 2009 accusing officers of looting their stores of cash and merchandise. Investigators, however, closed the case without interviewing all 22 merchants. In addition, three of Cujdik’s colleagues on the squad will be suspended, Ramsey told the Inquirer. Danilo Burgos, former head of the 300-member Dominican Grocers Association who is running for a state House seat in North Philadelphia, said last night that he was outraged at the delay in punishing the officers.